Elegant design; simplified circuitry and cleaner, edgier sounds. Only one finish option is disappointing. 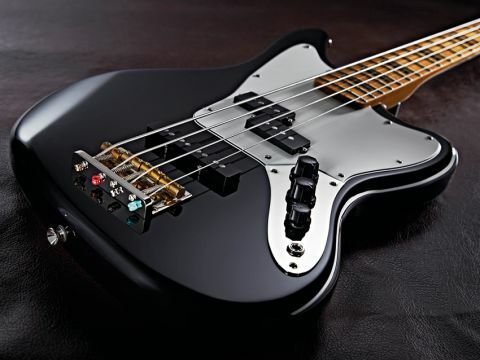 The emergence of the long overdue Jaguar Bass was a welcome addition to the Fender bass range. But good as the initial design is, it does - like the guitar - have a relatively niche appeal and some idiosyncrasies that put many players off. It's no surprise then, to see the Jag Bass arrive in the more affordable Modern Player Series, where the remit is to intelligently tweak an established design and bring it in line with the needs of today's bassists. It's marketed at a price that will interest a lot more prospective buyers as well. "There's also an extra edginess to the general tone that isn't available on the original Jaguar Bass - and it truly is a delight to hear." The instantly recognisable offset body shape was first seen on the Jazzmaster in 1958, then the Fender Bass VI in 1961 and the Jaguar guitar in 1962 but astonishingly, it didn't become a full-scale four-string until the launch of the Jaguar Bass in 2006! It's a great shape that still catches the eye and for this modification Fender has ditched all the extra switches and inset rotary controls associated with the Jaguar, presenting instead a much simplified design that's modelled more along the lines of the Jazz Bass - but with the added tonal abilities of a P/J pickup pairing. The neck is pure Jazz too, both dimensionally and in appearance, and adopts that '70s look with the classic black block inlays: ultra cool. The upgraded and sturdy raised-tail bridge assembly has been given the vintage treatment with the added luxury of brass saddles for improved tone and sustain. The triple-ply parchment-faced scratchplate retains the outline of the combined Jaguar 'plates, but here the controls are mounted on a standard Jazz Bass chrome-plated bell plate rather than the downward curved one synonymous with the regular Jaguar Bass. Undoubtedly a lot of thought has gone into this Fender-badged presentation. Yet curiously, it's currently only supplied with a black finish, which seems a shame. Avoiding the complicated circuitry of the original Jaguar design has helped enormously in bringing this bass in on a budget but curiously, as a result, we think this simplification and user-friendly arrangement will appeal to a lotmore players. It also has the benefit of the upgraded Modern Player designs for the two pickups. In fact, to be honest, this proves to be one of the best sounding P/J configurations in the current Fender catalogue. Along with the fantastic tonal range here, there seems to be a lot more punch, particularly when using the blended picked sounds. There's also an extra edginess to the general tone that isn't available on the original Jaguar Bass - and it truly is a delight to hear. Match the volume levels for a seriously scooped sound that you'll feel in your teeth as well as your stomach and although it's by no means a Rickenbacker, if you really dig in, this modified Jaguar will growl like the best of them, and live up to its name. There are now seven different variations of the Jaguar Bass - three Fenders and four Squiers. The original Fender model has now been discontinued and replaced by the Deluxe version, so six are available in the current catalogue. This offers a new, vital and streamlined approach. It's a way more affordable alternative to the Japanese-made Deluxe too, and with a tonality that's rather unique. Shame there's only one colour option, but this remains a very cool bass.